Home » Amphibians » What Do Frogs Eat: Read and Find Out! The health of your pet frog will depend mostly on what it eats, making it important to give careful thought on its meal plan. Otherwise, it can suffer from a variety of health problems. Frogs are carnivores, which means that they will eat small animals, such as crickets, snails, and worms. The size and species of the frog, among others, will have a direct impact on the specific choices of food to feed them. How Big Can a Frog Get? How Often Should You Feed a Frog? What is the Best Way to Feed a Frog? Do Frogs Need Vitamins and Supplements? In this section, we will have a round up of some of the best foods that can be given to a frog for it to stay in its tip-top health. Perhaps, this is the most popular food that is given to frogs. The good thing about crickets is that they can stay alive inside the enclosure for a long time. Plus, they are also affordable. Make sure to keep the crickets contained in the enclosure. It is recommended that you feed the frog two to seven crickets per day, depending on the size or the species. As the company claims, banded crickets are easy to keep alive compared to other cricket species, making it a great addition to the diet of your pet frog. It also has more protein. These crickets are fed food specially formulated for their needs, providing an assurance that it is packed with the nutrients that the frog will need. With this product, your money will not go into waste as the manufacturer guarantees the live arrival right in front of your doorsteps! Even at a temperature that is as low as 0-degree Fahrenheit, the crickets will be live when they are received. While live prey will be great for feeding frogs, freeze-dried crickets will also work. The good thing about this food is that it is already gut-loaded, making sure that it contains the nutrition that the frog needs. It is naturally high in calcium. This is as against live crickets that you will still need to sprinkle with a Vitamin D3 or calcium supplement. It contains protein, fat, and fiber to guarantee a diverse and balanced diet. Nonetheless, you have to make sure that you feed your cricket with other foods as well. Take note that unlike the first two products that have been mentioned above, this is not a cricket to be fed directly to your pet frog. 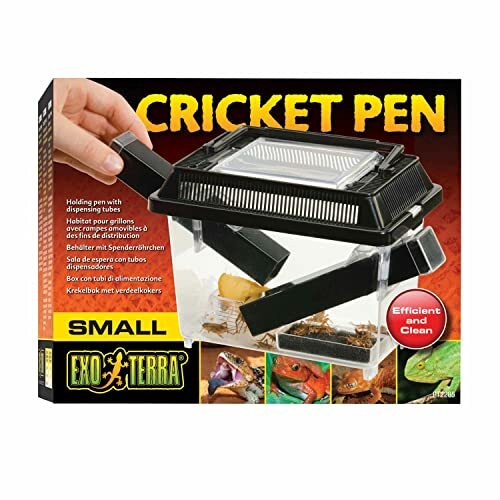 Rather, it is a handy tool that you will use when dispensing live crickets. It is constructed in such a way that crickets will love, especially because it is a dark space with a cover. This is a good way to direct the crickets to the frog basically because it is not recommended that you handle the frog when it is being fed since this can be mistaken as a threat and the frog might become aggressive. They are brown worm-like larvae that are popular as pet food, especially for reptiles and amphibians. When feeding mealworms, it should be given in small quantities. This is because they are high in starch, and hence, too much of it will make your pet suffer from liver damage. These mealworms are medium-sized at ¾-inch. According to most of the people who have bought this item, the mealworms are fat and nutritious, making them great feeders. The manufacturer guarantees its live shipment, providing pet owners with an assurance that they remain fresh even through transit. When they are shipped, they are packaged in breathable cloth bags. If they are not live when received, just get in touch with the seller and they will issue an unconditional refund or replacement. It is important to be picky when it comes to what you feed your frog, which makes this another option that is worth considering. It is non-GMO and as pure as it can be. It has no preservatives and additives, which can provide you with peace of mind. When fed to frogs, the dried mealworms will be effective in giving their immune system a boost and in promoting their overall health. 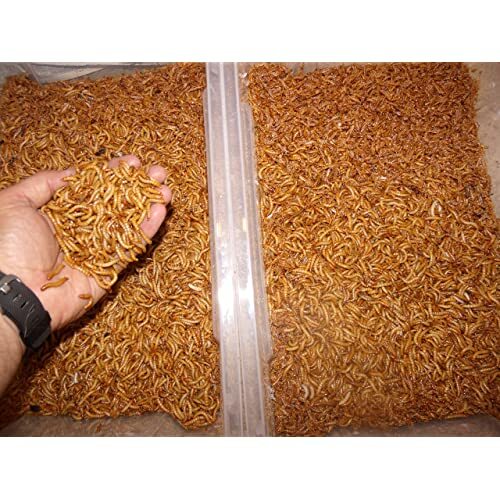 Ease of handling is another good thing about this product, making it a better option compared to live mealworms. There is no refrigeration required. The waxworms will be a great addition to the diet of your frog basically because it is a potent source of lipids, which will help in fattening up your pet. However, it should be noted that waxworms are junk foods for the frog, which is why they should be given sparingly. Giving too much to your pet can make them obese. Although there were some negative feedbacks from the buyers of this product, the consensus is that it will make a great choice if you are looking for waxworms to feed frogs. There were some complaints with regards to having an unpleasant smell. To prevent the latter, you have to pay attention to its proper storage to prevent having dead worms, which can be the cause of the foul smell. Fatten up your frogs by giving them these waxworms, which are shipped live. They are shipped only Mondays to Thursdays. The company also guarantees that there will be fast shipping to prevent the worms from dying while they are in transit. It is recommended that you keep the waxworms at a temperature of 45 to 55 degrees Fahrenheit to keep them fresh for an extended period. Lastly, the seller also guarantees that you will receive them live. If you have an aquatic frog or a tadpole, you will benefit from giving them pellets and micro-pellets. All that you have to do is to throw them in the aquarium and let the frogs enjoy a feast. Packaged in a two-ounce container, this is made by one of the most trusted brands of pet foods in the world. It is high in protein, making it an excellent addition to the diet of all types of aquatic frogs and tadpoles. It also has fat, fiber, ash, moisture, and phosphorus. The pellets are specially formulated to provide the vitamins and minerals that are necessary for the longevity of the frog. To be more specific, the micro-pellets contain Vitamin A, Vitamin B, Vitamin C, Vitamin D3, potassium, copper, zinc, and manganese, among others. The pellets contain Vitamin A, Vitamin D3, and calcium, all of which are essential for keeping the frogs in their best state of health. It will help prevent diseases that are common when the frogs are not supplemented with the vitamins and minerals that they need. It is also low in fiber, which will be beneficial in terms of improving digestion. These pellets are made with the use of nothing but fresh ingredients, which include halibut and salmon. There are no fillers, so you can be confident of its purity. As recommended by the manufacturer, you have to feed the frog with three to four pellets daily. Individual requirements will vary depending on the type of the frog you keep. As a responsible pet owner, you should know that you cannot feed your frog with just almost anything. You need to do your research to be sure that it receives only the right food. Take note that they can be easily prone to obesity, so they should also be fed in moderation. Because frogs are carnivores, you should never provide them with fruits and vegetables. While you might think that they are healthy for humans, it is a different story in the case of frogs. You should also never feed the frogs with insects that have been caught in the wild. They can contain insecticides that can be toxic when they are ingested. While live prey will be a great addition to the diet of your frog, see to it that it is appropriate for their size. If it is too large, they will not just have a hard time eating and digesting the food, but it can also end up biting them. Before we end this post, allow us to answer some of the most frequently asked questions about frogs and their diet to enlighten novice pet owners. This will depend on the species of the frog as well as its diet. If you feed the frog with the right foods, it is easy for it to grow bigger, although such is not the only thing that impacts its growth. The largest frog is known as the Goliath Frog, which can have a maximum length of 13.5 inches and a weight of 6.6 pounds. The smallest, on the other hand, is the gold frog, which has a length of only .39 inch and a weight of 7 ounces. One of the things that will dictate this would be the age of the frog. When it is still young, you have to feed it every day. When the frog is an adult, however, feeding can be done only several times a week. One thing that you have to know about frogs is that they hate being handled. This can make them aggressive since they feel threatened. It will be good to have a small dish where the food can be placed or feed it straight into their mouth. Like with other insects, you need to provide vitamins and minerals to the frog. Different species may have varying needs, so you have to find out what is essential for your pet. Among others, one of the most important is Vitamin A. It cannot be produced by the body of the frog on its own, which makes supplementation important. With this, you should gut-load live insects with Vitamin A before they are fed to your pet. Taking care of your frog necessitates not only the need to provide food but also water. They should be given fresh and dechlorinated water. While you can give tap water, it needs to be treated so that the chlorine will be removed. However, take note that frogs do not directly drink water like humans. Rather, it is absorbed through a process that is called osmosis. On their abdomen, they have a patch of skin that allows them to absorb water. With this, the best way to keep the frog hydrated is to mist their enclosure. In sum, frogs need to have the right diet to be able to maintain their best state of health. Otherwise, they will be prone to a number of health problems. It is important to not only give them the right food but to also make sure that these foods are given in moderation.